A proposal to create an incentive for owners to set aside vacant property in San Diego for urban agriculture received a tentative go-ahead Wednesday from the City Council's Smart Growth and Land Use Committee. 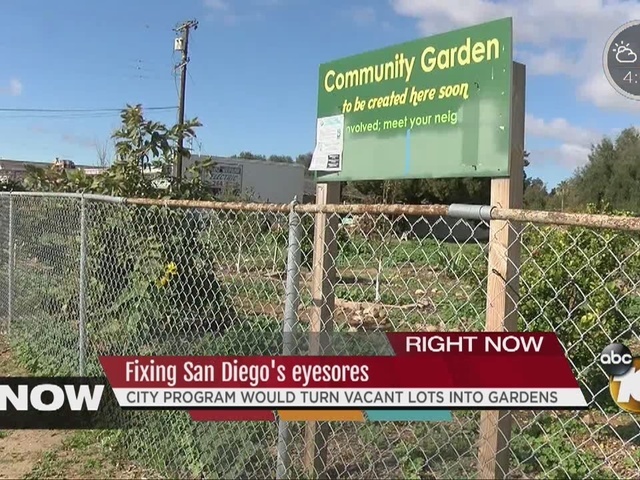 Under the Urban Agriculture Incentive Zone program, property owners would be allowed to enter into contracts at least five years long with the city and county of San Diego to allow their vacant, unimproved or blighted land to be used for agricultural uses, like community gardens. A landowner would benefit, in return, when a piece of property is assessed using the per-acre value of irrigated cropland in California, which would be lower than a normal assessment. No zoning changes would be required. The property would have to be between one-tenth of an acre and three acres, and the entire parcel would have to be dedicated to agricultural use. Councilman Scott Sherman said he has his own plot in a community garden. "It's a community gathering -- people show up there for different events," said Sherman, who introduced the proposal. "We have everybody come together -- we have pumpkin smashes after Halloween, we have all kinds of spring events and clean-ups and those types of things, but it brings people in the community together, and it gives them a chance to interact in a place where they maybe wouldn't ordinarily interact," Sherman said. "To use tax incentives to help property owners have a little bit of an incentive to work with these communities and provide these spaces I think is a great start," he said. The committee passed his proposal unanimously, but it needs to go before the full City Council for approval. The program wouldn't take effect until the Board of Supervisors passes a resolution adopting the incentive zone, since property taxes are processed by the county. According to staff, the item is set to come before the supervisors next month. The incentive program was authorized by the state Legislature in January 2014.